The popular Egusi soup which is also known as melon soup is a delicacy that is enjoyed in West Africa. Egusi is the West African name for melon seeds, the seeds are rich in fat and protein and when dried and grounded, it becomes a staple ingredient in so many West African foods and it is one of the most popular soups in most tribes in Nigeria. Egusi soup is a soup made with leafy and other vegetables which is thickened with ground melon seeds. The soup is often paired with pounded yam, eba, tuwo, banku, amala and many other swallows. However, some people substitute egusi seeds with pumpkin seeds when egusi seeds aren’t obtainable. But this doesn’t give the same great flavour that egusi gives. The egusi seeds or the grounded egusi can be obtained from most African shops. There are lots of variations in the way Egusi soup is prepared due to the loads of distinct ethnic groups in West Africa. However, whichever way it is prepared, Egusi soup will always come out as a delicious meal! This recipe and instructions will show you how to make Nigerian Egusi soup. The popular Egusi soup which is also known as melon soup is a delicacy that is enjoyed in West Africa. In a large pot, heat the palm oil on medium for a minute and then add the Une Iru. Fry the chopped onions in the oil for about 3 minutes and add the Une iru for a distinctive aroma (Une Iru is optional). Add the stock (from the meat and fish) and set on a low heat to simmer. Scoop the egusi paste mixture into the stock. Leave to simmer for 20 – 30 minutes so it can cook through. Add the meat and fish and other bits which you would like to use. Add the chopped spinach leaves. Stir and put a lid on the pot and allow cook for 7–10 minutes. Add the bitter leaf (if you want to use bitter leaf, bitter leaf is however optional) Leave the lid off while the cooking finishes for another 5-10 minutes. Stir, check seasoning and adjust accordingly (Taste for salt, bouillon cubes and pepper). 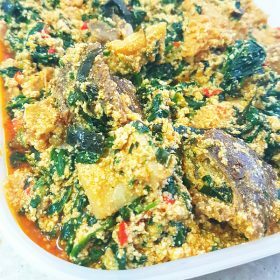 This entry was posted in Nigerian Food and tagged African food, African recipe, Egusi, Egusi Soup, Melon, Melon soup, Nigerian food, Nigerian recipe, Soup.